The Hunter: Primal – A game with dinosaurs. Well, there’s this early access game called The Hunter: Primal which happens to be an interesting game to play. So, while I’m sick in bed with the flu, I decided to just try it. For 20 euro’s it would probably offer me some fun and a small adrenaline rush. It’s new and still under development but the early access is already very promising. Boy, I was wrong… It’s real great already and really gets your adrenaline pumping! Why? Because you, the player, gets dumped on a strange planet with three prehistoric animals. And two of those will hunt you! And the weapons you have to protect yourself? Well, if you’re lucky you’ll start with an improvised bow and 5 arrows. There are better weapons but you will have to find them. And you’ll have to find ammunition for those weapons too. And possibly find some other useful gear. But it’s most likely that you’ll end up with just that bow for a long time. Right now, there are three types of dinosaurs that you can hunt. The most interesting is the triceratops, a colossal beast that gets scared quite easily. I never had a weapon powerful enough to kill it immediately and to be honest, I’m trying to save my ammo to protect myself against the other dino’s. This huge herbivore makes a nice trophy, though. 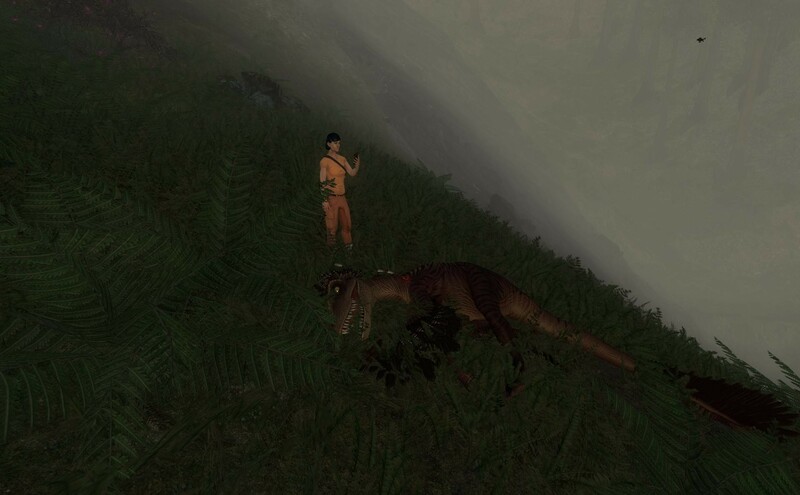 And so far it’s the only dino that hasn’t even tried to kill me. Next, the T-Rex. Big, brutal and deadly. Fortunately, they tend to be noisy and when they walk around, they stomp loudly. And that makes some very good warning signals against them. Still, they are very hard to kill and they can kill you with a single bite so I try to stay away from them. And then there’s the Utahraptor, named after the place where they’ve found their bones. A pack animal and a keen hunter. Not as deadly as T-Rex but still very deadly if you’re not careful. Especially when you meet a complete pack. You might need several shots to kill them, though. But that’s more because you did not aim correctly or tried to hit them in the head. These raptors are more vulnerable in their chests and neck so better aim for those areas. I did manage to kill one with a single arrow shot in the neck so a single shot can kill them. You just need a bit of luck. If you need a second shot, the raptor will be on his way to bite you so you will end up hurt. If you need more shots, you’re likely to be doomed. So far, I’ve managed to stay alive with one character for more than 5 hours. Real hours, that is! And I still have just a bow and arrow because I’m stuck in an area full raptors and a T-Rex. But what I’ve noticed from all my gameplay so far (16 hours and counting) is that these dinosaurs seem to follow very natural patterns. And by learning those patterns you can try and survive in this environment. So, the lesson I learned was that raptors like to bathe in the morning. So in the morning, stay away from the water, including the lakes. I also learned that they really start hunting in the afternoon and early in the night so at those moments they are more in the forest, making the beach and water areas more safe. This is useful to know since you can now estimate their locations based on the time of day! Then the T-Rex. I had noticed that he spends most of his time on the hills, close to the forests. So I walked downhills towards water in the early morning expecting just raptors. Nope. Even T-Rex likes his bath and he will walk to the lakes too in the night for his morning bath! So we had a brief encounter. Me with my shotgun and T-Rex with his wide smile. And no, one shot doesn’t kill a T-Rex. Don’t know if two shots would have, though. He was chewing on me by then. Still, I’m trying to learn to evade these dino’s while searching for better weapons. Not so easy when the game dumps you on the wrong side of the island so you have to cross it through T-Rex his domain. How I know it’s his domain? Well, its eggs were there. (Eat them and you have 1 minute to run before T-Rex goes after you!) And it’s an area with not so many hiding places so moving though it is slow. Especially when you take time to discover treasure boxes. Those treasure boxes is what helps you survive. Since you start with 5 arrows, you would be able to kill up to 5 raptors before the 6th kills you. So you need treasure to get more arrows and other weapons. You can also find other useful things like clothes, small pieces of the world map that you can drag on your pad and healing canisters that you can equip and then use when need be. But the amount of stuff you can carry is limited so you can’t take everything you find. But what you need most of all are weapons and ammunition. And preferably scopes for your weapons so you’ll aim better. You can basically have a bow, a pistol, a shotgun or a rifle and you can equip two of those weapons if you have them. (But only shoot with one.) But the ammunition for your pistol won’t fit in your shotgun or rifle so what to do if you have a shotgun and only find ammo for a pistol? At one point, you can’t carry more and thus have to decide about leaving things behind. And try to find that pistol you need or the ammunition for the shotgun you need. Another problem is deciding what to do when you run out of ammunition! I saw a video on YouTube of a player throwing a rock at a T-Rex because the hints of the game suggested something like that. No, don’t throw rocks at dinosaurs because that makes them just pissed off! Find a tree at some reasonable distance and try to hit that tree with your rock! The noise it will make will likely distract the dinosaur into moving away from you. Still, don’t walk away because it uses its ears to hunt too, so if it hears you crawling, it will turn around again, towards you! Stay still, crawl and hope the dino will continue in the direction of your stone throw. Only move when you’re sure it is far, far away. I also discovered some other useful thing. Part of the forests have these huge, mangrove-like trees with huge roots that tend to have a hollow center. These make excellent hiding places as long as you’re crouching or crawling. I’ve had a pack of 4 raptors roaming in front of some tree that I had hidden myself inside (ran out of arrows) and they did not notice me there. Then again, you can’t move much inside trees so you will need some patience to wait for the raptors to disappear, which could take some time. Still, I’ve hidden in those hollow trees more often afterwards and even killed raptors by shooting from that hiding place, simply because they were close enough for my aim to be perfect. The one time I did get killed was because I had used a gun from my hiding spot and that sound attracted the three other raptors that were near the one I shot. This entry was posted in 3D, Games, Online games. Bookmark the permalink.